In my last post I talked about how to spell consonants. This week, we will cover how to spell vowels. It is important to note that when I say “spell” consonants and vowels I am talking about how letters can make more than one sound. For example, a makes a long and short sound, as in make and tack. But to spell the letter a, we can use many combinations to make the long a sound. For example, the long a sound can be spelled using the letters ai, as in rain, train, brain. The difference that comes out of this is, if someone asks, “What does the letter i say?” You would say, ĭ as in igloo, or ī as in pike. If someone asks, “How do you spell i?” You would say, “With the letters I and y, as in pick or gym. Here are the vowel sounds and how to spell them. yoo – u, u_e (cute),ew (few), ue (rescue), eu (Europe) – Tip: for long u, deciding if the word is yoo or oo, if a word begins with c, f, or m it will be yoo rather than oo sound – examples: cube, few, mew, fuel, muse, music. 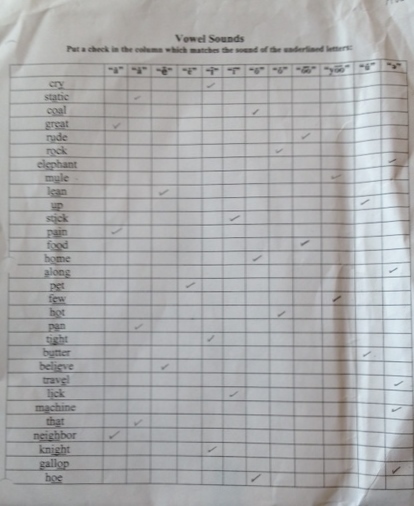 Here is an exercise on how to use this spelling vowel sounds concept.